Something bright, yellow, and slightly round will be making its way to Seattle next week. 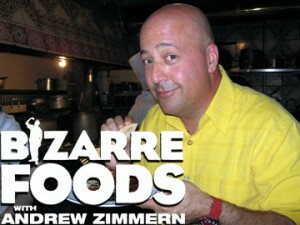 Andrew Zimmern is coming to town to look for bizarre bites. A more local and recent television personality, Scott “Seattle Food Geek” Heimendinger, was kind enough to refer Zimmern’s research team to me several months ago. In extensive (and sometimes exhaustive) conversations, we discussed possible themes (including an “East meets West” theme) and restaurants to include for a future episode of Bizarre Foods. And, in turn, I was pleased to refer the show to another prominent food writer, Lorna Yee (who I showcased at TheSunbreak.com in the past), who will serve as Zimmern’s guide for part of the local shoot. So just where will Zimmern find freaky food in Seattle? Early word is that he’ll be hitting eateries old and new. Food trucks and International District locations are likely to be in play. [Ed. : I’ve removed the specific locations/dates at the show’s request to avoid crazy crowd scenes.] Natto (spiderweb-like fermented soybeans), stinky tofu, balut (fertilized duck embryo), and shirako (cod sperm) were among my recommendations for Zimmern to try; come to think of it, that sounds like a dream meal for me, and far from bizarre.